When: Friday, March 18 at 5 p.m. & Sunday, March 20 at 1 p.m.
CLEMSON, S.C. – The Clemson men’s tennis team travels to Georgia Tech on Friday and Wake Forest on Sunday, facing two high quality ACC opponents. The Tigers face the Yellow Jackets on Friday at 5 p.m. at Ken Byers Tennis Complex. Live stats are available at http://www.ramblinwreck.com/sports/m-tennis/sched/geot-m-tennis-sched.html. For a small fee video is available at http://www.ramblinwreck.com/collegesportslive/?media=523377. On Sunday the Tigers travel to Winston-Salem to face #10 Wake Forest at 1 p.m. Live stats will be available at http://www.wakeforestsports.com/livestats/m-tennis/xlive.htm. 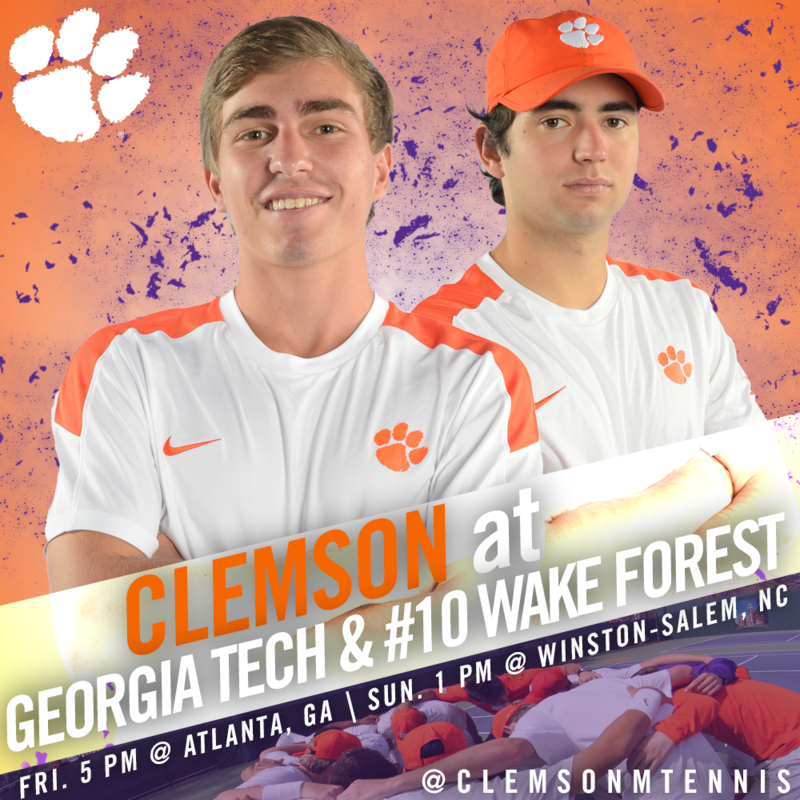 Updates will also be provided for both matches via Twitter, @ClemsonMTennis. Scouting Georgia Tech: The 32nd ranked Georgia Tech men’s tennis team is 10-4 overall and 3-1 in ACC play, losing to Wake Forest. The Yellow Jackets are led by doubles partners, Casey Kay and Michael Kay, nationally ranked 65th. The all time series record is 29-26, in favor of Clemson. Scouting Wake Forest: The Demon Deacons of Wake Forest are currently 18-4 overall on the season and 3-1 in ACC play, losing to the current nations number one team Virginia. Wake Forest is currently ranked 10th in the country, led by the 19th ranked singles player, Skander Mansouri. Clemson leads Wake Forest all time with an overall record of 43-30.